Sales were modest but more than what many Midwest grain dealers had seen in a while. Farmers returned from the three-day holiday weekend and sold corn and soybeans on Tuesday in reaction to higher futures markets. The sales were modest but more than what many Midwest grain dealers had seen in a while. Corn and soybean futures both inched up to about one-month highs on Tuesday, lifted by more positive news here and overseas. Better earnings from key banks and talk that China may initiate some economic stimulus measures cheered up investors, who bid equities higher early. “They have seen these rallies come and go, so they decided to sell now,” an Illinois dealer said of the farmer selling. Similar sentiments were voiced in Iowa, where farmers sold more corn than soybeans. When the markets closed on Tuesday, corn and soybean futures were both about 4.5 cents/bu. higher for the day, putting prices for the lead months at their highest since before Christmas. Corn was being shipped by train to the Southeast markets to supply poultry operations or ethanol plants, while at least one soybean train was sent to the Gulf for export. River markets are closed in Iowa, but a river dealer was still buying soybeans at 5 cents over processor bids to ship downstream when the Mississippi River opens in mid-March. Snow entered the Midwest over the weekend and should continue through Thursday. Western Iowa had about 6 in. on the ground, and 1-3 in. more were forecasted on Tuesday. The snow did not impede loading operations, and trucks and trains were not affected, dealers said. The U.S. Department of Agriculture’s "Grain Transportation Report" released last week said grain railcar loadings for the week ended Jan. 2 were down 19% from a year ago, but 2015 year-to-date loadings were up about 3% from 2014. In the report’s fuel segment, USDA said the average U.S. diesel fuel prices in the week ended Jan 11 decreased 3.4 cents from the previous week to $2.18/gal. and were down nearly 88 cents/gal. from a year ago. In the crops, weekly export inspections were a little better than expected for soybeans and about as expected for corn and wheat. USDA’s weekly export inspections on Tuesday showed soybean shipments at 51.3 million bu., up 12% from a week ago but down 8.3% from a year ago. China was again the largest recipient, with Spain and the U.K. taking sizable amounts. Year-to-date shipments for the crop year are down about 11% from a year ago. 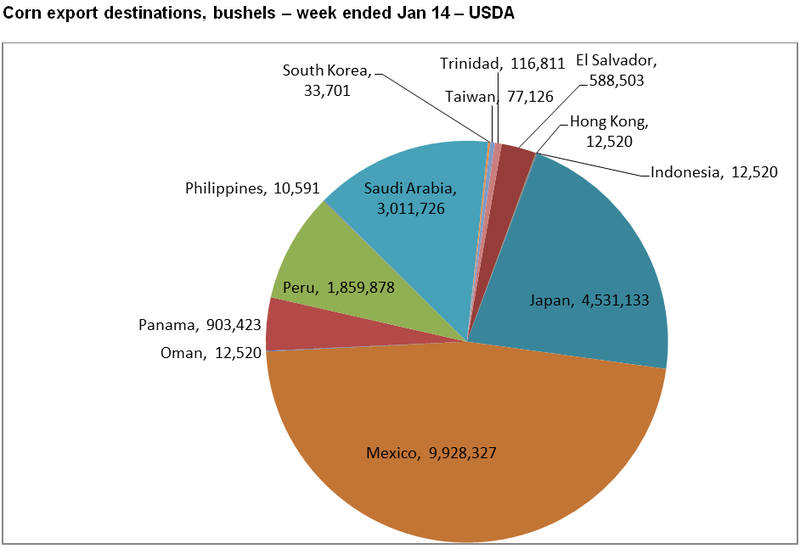 Corn export shipments of 22.9 million bu. were up 5.6% from a week ago and down 22% from a year ago. Mexico was the leading destination, followed by Japan and Saudi Arabia. Year-to-date shipments are down 21% from a year ago. 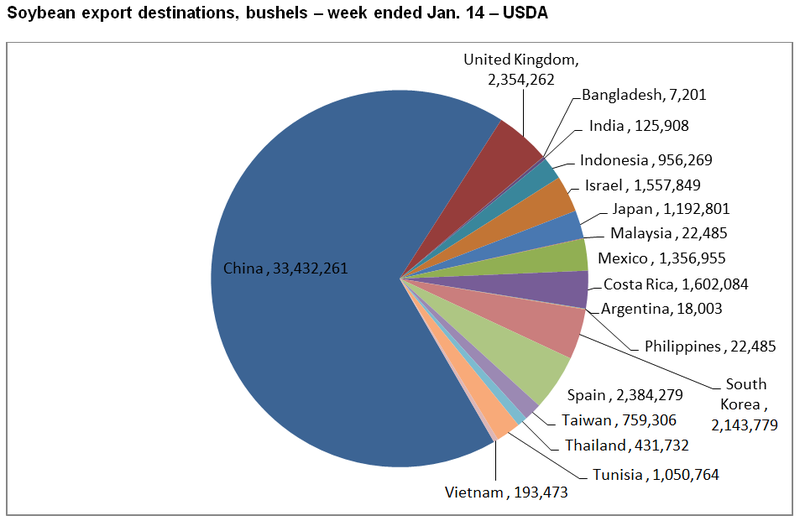 Weekly wheat shipments of 12.5 million bu. were down slightly from a week ago and up from a year ago. Japan, Colombia and Guatemala were the leading markets. Year-to-date shipments for the crop year that began June 1 are down 10.5% from a year ago.